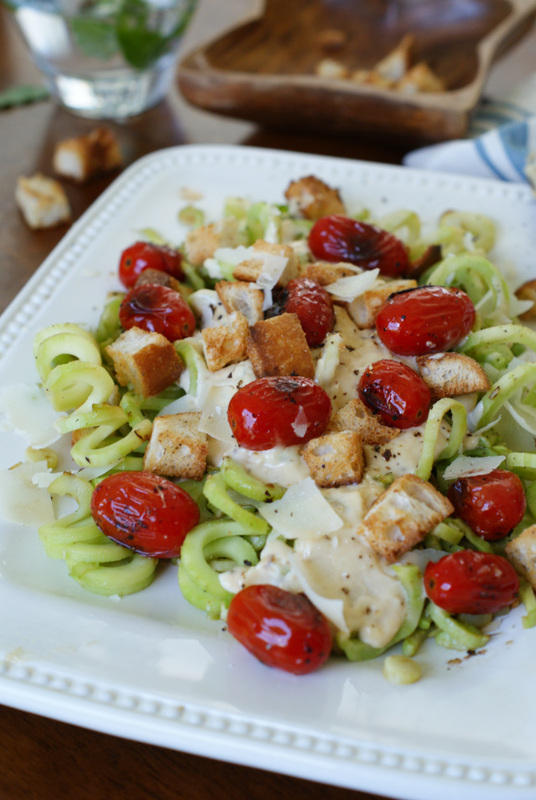 Caesar-Style Spiralized Broccoli with Blistered Tomatoes transforms broccoli stalks into a delicious side dish topped with garlicky homemade caesar dressing, pan seared tomatoes, croutons, and parmesan cheese. I am so excited about this recipe on so many levels. First, I love me some broccoli. Nine times out of ten, it's my first veggie of choice. Not only do I love the florets, I'm a big fan of the stalks, too! Just in case you didn't already know, broccoli stalks are totally yummy and such a waste to just throw away. That is pretty exciting stuff for a broccoli lover like me. Oh, and those delicious broccoli stalks? In this recipe, they're spiralized! It doesn't get more exciting than that! Ever since I got my KitchenAid spiralizer attachment, I've been a spiralizing fool. The excitement of the purchase still hasn't worn off and I don't think it will for a very long time. I want to spiralize everything! All you have to do to prepare the broccoli stalks is give them a little peel, cut the ends so they're flat, and they're ready to go. They are not as broccoli tasting as the florets, but rather sweet and super crunchy. I know you'll love them. 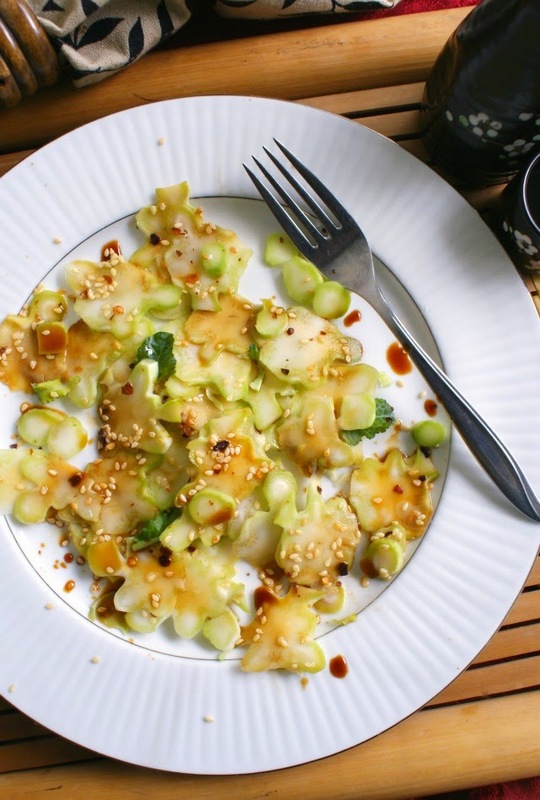 For this recipe, they are given a quick saute, but they are super tasty raw, too! Another layer of excitement comes from that lush, bold, cheesy, garlicky homemade caesar dressing. 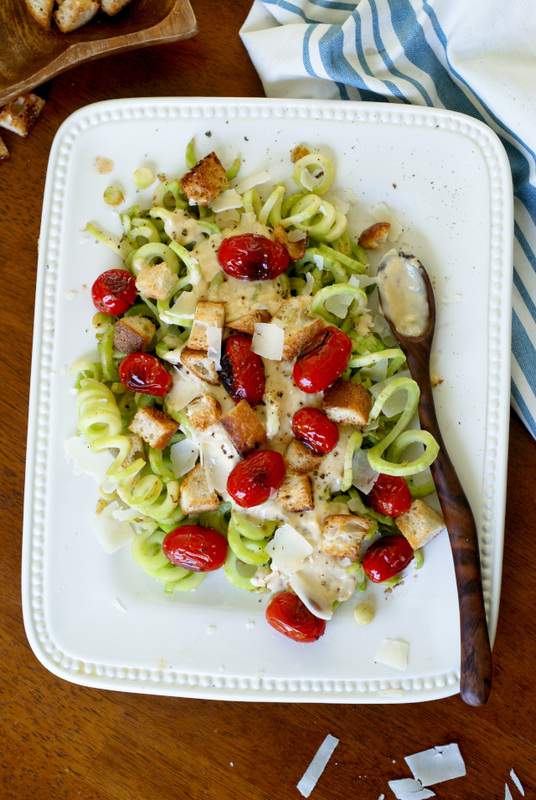 With just a few whirls of the food processor, you've got a dressing that rivals anything that comes in a bottle. Beware, though, when I say garlicky, I mean this stuff is for garlic lovers only. Which I totally am, so I love this stuff! Then there are the beautiful grape tomatoes that are seared in olive oil in a nice hot pan. Dressed with just a little bit of salt and pepper, they are the perfect burst of bright flavor to accompany the bold dressing. Put all of the elements together and you have a think outside the box, waste not want not, absolutely delish side that is a super exciting way to prepare broccoli. At least in my book! In your food processor, process the garlic until minced. Add the mayonnaise, vinegar, mustard, worcestershire, and parmesan cheese. Begin processing, then slowly add the olive oil while the machine is on. Process until the dressing reaches your desired consistency, stopping to scrape down the sides with a rubber spatula as necessary. To thin, add a little more olive oil. Add the pepper and pulse until combined. 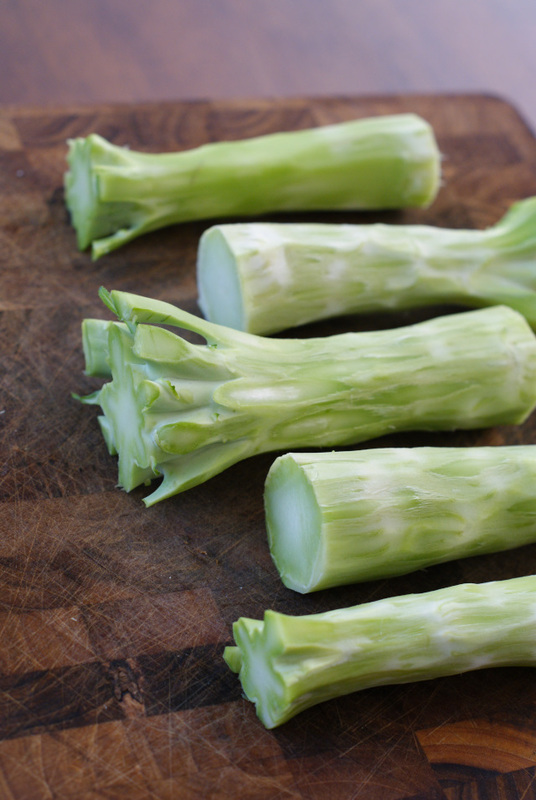 Peel the broccoli stalks and cut each end so that it is flat. Spiralize using a spiralizer and set aside. Heat 1 Tbsp of olive oil in a large skillet over high heat. Add the tomatoes to the pan and cook for 2 minutes without stirring. Stir and continue cooking for another 2 minutes, shaking the pan frequently. Remove the tomatoes from the pan and set aside. Season with salt and pepper. Reduce the heat to medium-high and add the remaining Tbsp of olive oil to the pan. Add the spiralized broccoli, season with salt and pepper, and cook for 4-5 minutes stirring frequently, until just beginning to soften. Place the broccoli on a serving platter and drizzle with the lemon juice. 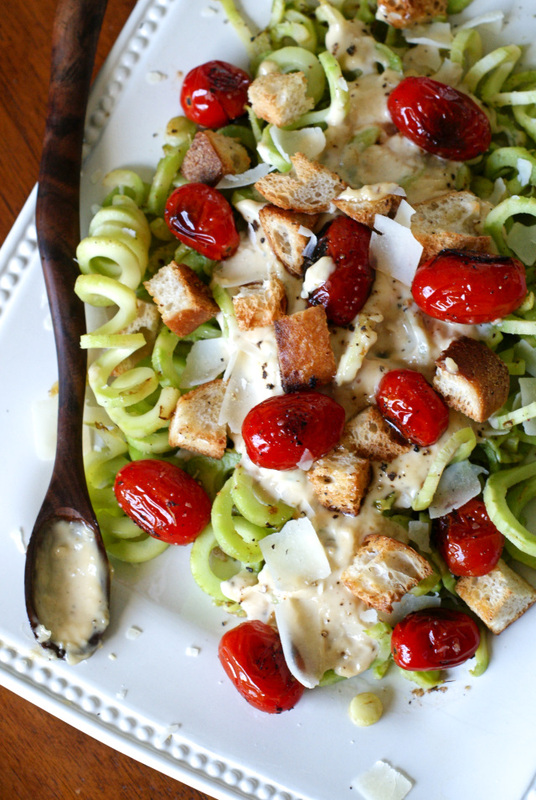 Spoon the dressing over the broccoli and top with the tomatoes and croutons. Garnish with additional fresh ground black pepper. I usually eat broccoli at least twice a month. I will use the florets and save the stalks in a big baggie in the fridge until the next time we have broccoli. Then I'll have enough stalks to make this dish! They keep very well and will last several weeks. Adjust the amount of dressing that you spoon over the broccoli according to your tastes and amount of broccoli. Here is another one of my favorite easy broccoli stalk dishes that doesn't use a spiralizer.